I have a lot of free time so I can kind of keep dipping my pie plate into the bottom of the Twitter river. I rinse away lots of dull commentary and lame jokes. I retweet the solid laughs and star the things that amuse me but don't match my idiom. Sometimes as I'm rinsing the mud out of my pan I get some gold dust and a few nuggets. 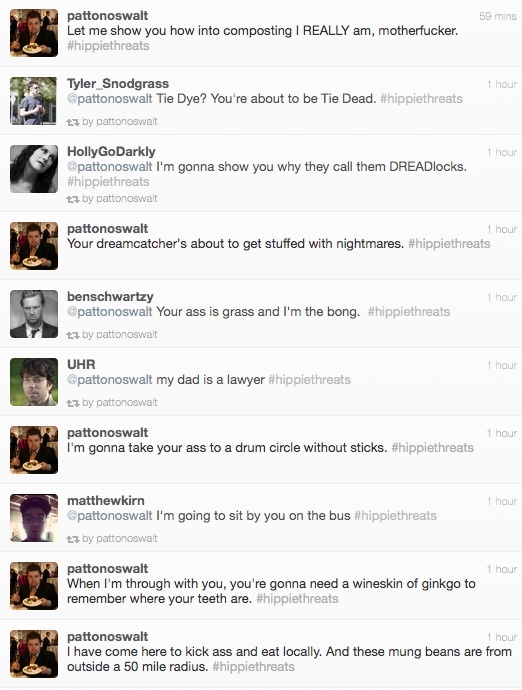 Last night that happened around 2 am on Patton Oswalt's feed. I put down my phone and woke up the computer to make these screen shots. I let Patton edit the selection and these are his retweets. It's impossible to trick Twitter into showing you the timeline in reverse so you just have to read them scrambled up. I think these jokes resonated with me particularly because I just went to the co-op last week and got mung beans. I'm growing my own sprouts. The mung bean joke was the first one. My favorites are "My dad is a lawyer" and "I'm going to sit by you on the bus."